My love for the shoes manufactured by Joya is well-known! They are, by far, my favourite shoes. I've been wearing my Joya Venezia (Grey / Beige) for several months now. I can't live without them -- they are that good. I wrote a review of the Venezia in July 2011. 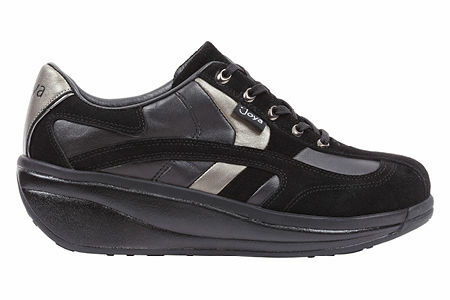 The new Venezia in Black is a simply amazing and superbly functional (not to mention attractive) shoe. It offers a soft, stress-free stride. The arch support is perfect for those of us with high arches. The shoe has a bit larger box for those of us with wide feet, too. This is a shoe that FITS from the moment you put it on. There was no "breaking-in" period for me. Best of all, the heel fits snugly and there is no rubbing to cause blisters. There is so little pressure or stress on your feet. The shock of the foot-strike is so well-absorbed by the shoe's construction. I have literally been on my feet all day and NEVER had my feet or legs hurt. I must tell you -- these shoes have also been a heaven-send for my back, too. When compared with rocker sole shoes, normal shoes and athletic shoes, our laboratory findings demonstrate (below) that Joya relieves pressure points and hot spots much more efficiently than these other shoes. Due to its internationally patented Joya Sole Technology, the Joya exhibition (left below) indicates virtually no pressure points at all. Thus further validating Joya’s premium comfort shoe attributes. The Joya Venezia is very suitable for all day wear. They are quite seriously the most comfortable shoes I've ever worn. They are made of sturdy, durable materials. There is no breaking-in time required. They fit at once. While they 'hug' the feet, they do not constrict the feet, thus your foot's movement is much freer. There is no restriction or limit on motion: forward, backward, sideways -- the shoe adapts to you. I like the sewn-in, moisture-wicking insole. It stays put and the massaging effect is very relaxing and soothing. 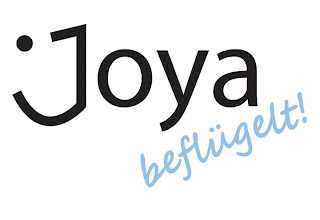 @joya_shoes on Twitter and at Joya-Shoes on Facebook. ***ATTENTION! *** Every 100th person who joins the Joya Shoes Facebook page... also gets a free pair of shoes of their choice! Joya has generously offered THREE (3) of my readers a wonderful Holiday gift -- a pair of Joya Shoes of the winners choice! I received a pair of Joya Venezia shoes for the purpose of this review. I received no monetary compensation. The opinions expressed herein are my own and based on my own use of and experience with the item. I'd most like to have the Comfort Black shoe. Thanks for the chance to win. I'd like the Joya Vertigo Proof-Tex - for Winter! I like the Marilyn Brown. 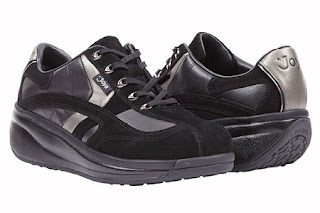 I like the aloe nera shoes in black. I would like to win Venezia Black. The Venezia Black are my favorite. I like the Star Brown model. What a neat shoe...I'd luv to get the Lugano Brown for my Hubby. I like the Aida Browns and Skogs. I like the comfort in black. I would like the Cairo Black. Oh, I want those Heidi boots! I'd like to win the Miami Blueberry. The Comfort Black would be ideal for work! I'd love to win them! I'd love to win the Dolce White shoes. For myself, I like the Skogs the best. Tough I think if I won and I could have any shoe, I'd get my Mum the Aloe Nero or the Marilyn Black. Her birthday is coming up and these just look so comfy, I think they would be better for her than the ones she has now. I love the Marilyn brown! I'd most like to win Heidi Black ヅ *Thanks* for the giveaway! I would like to win the Venezia Grey. I have a very bad back and I have a feeling these shoes would really help! my favorite is the miami blueberry! I would love to win the Venezia Grey/Beige. They look amazing. I would want the Heidi Black! I like the Men's Bolero Black, Thanks! I like Men's Cruiser Brown. i would pick the Marilyn Brown! So cute. i also loved the boots, such a hard choice! !